I talk about the weather a lot. But, you know, I live in Florida, so it tends to be at the forefront of our minds — in the cooler months we discuss how grateful we are to not have all the snow our friends and families up north are getting, in the summer we complain about the heat, and, of course, hurricanes and thunderstorms frequently give us easy small talk fodder. But here’s the thing: I don’t love talking about the weather, and, for the most part, I think that’s probably true for just about everyone. But it’s easy — we’re all experiencing it at the same time, so immediately we have something in common. And it’s pretty darn innocuous, which has become increasingly important given the state of the world. So, yes, it’s great to have something easy to talk about with strangers, but it’s too superficial a topic to really build a connection. And that’s what a conversation is really about, right? Connecting. A lot of other questions that are often asked at the start of a conversation might offer the possibility of something deeper, but have their own issues. I mean, it’s not that I’m not curious about what someone might do for a living, but I don’t like leading with it because, well, that’s what they do — it’s often not who they are. What I really want to know — and what I think most people really are curious about when they ask about occupations — is what people are passionate about. What are they into? What do they find exciting? What inspires them? The answer might be tied into their job, or their family, or where they live. Or, it might not touch on those things at all, which is what makes it such a fun thing to learn and discuss. However, let’s be real. Meeting someone and saying, “Hi, I’m Kristen. What really makes your soul sing?” is a super weird way to kick things off. And I seriously don’t need more ways to be awkward at parties. So, I’ve been thinking of ways to get people talking about the things that are meaningful to them, because hitting on topics that really resonate with someone is far more likely to encourage a deeper and more meaningful conversation than something like, “So, where are you from?” I find that starting with a topic that you’re really into and think they might dig is a good start, but it’s important to be open to the other person steering it in a different direction than you’d planned. Have an answer ready for any questions you ask. Nothing is worse than responding really thoughtfully to someone’s query, then having them shrug their shoulders when you ask the same question of them. Encourage people to share. People like to feel like they’re interesting, so usually, giving people a chance to talk about themselves — and then really listening — is a good way to make them feel comfortable. Don’t let it be one-sided. If someone starts a conversation by asking you about yourself, answer, then reciprocate. Start by offering a (sincere) compliment. This is especially good if it can be followed up with a question (“I love the braid in your hair. Do you have a secret for how to make it look so full?”) or a clever anecdote (“The dog on your sweater made me smile. I grew up with a Dalmatian named Pongo, and I swear he had the exact same markings!). Bonus points if you offer a compliment that has nothing to do with their looks, maybe commenting more on something you’ve noticed about their personality (if you’ve had the chance to do so). Come up with a question you dig, then open with it over and over. It hit me while reading this article that I’ve been doing this for years because of my work. Whenever I’ve got an article that I’m trying to flesh out and want lots of different perspectives, I just ask everyone I know and anyone I meet about it. It might be about gifts to give your vet, or what your favorite post-workout food is, or whether you’d rather give up coffee or wine for a year, but being able to open with, “I’ve been asking everyone this question and would love to hear your thoughts,” makes even a topic that’s totally out of left field a lot more accessible. What’s your favorite thing to do for fun? Have you been anywhere interesting lately, or have plans to go somewhere that excites you? Have you read anything lately that you’d recommend? There are some interesting movies out — have you seen anything you loved recently? What’s your next adventure going to be (if you’ve heard that they’re the adventurous sort)? What’s the most important (or interesting) thing I should know about you? What was the highlight of your week so far? What’s the first thing you do when you get home after work? 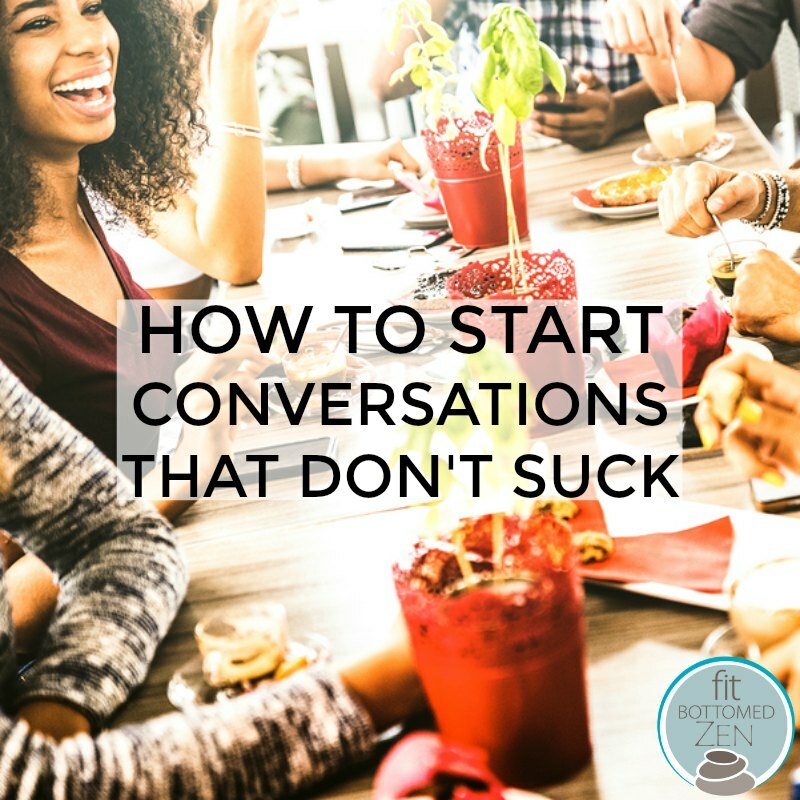 Now, even a killer opener doesn’t guarantee a perfect conversation, so if you feel like getting answers from them is a bit like pulling teeth — or notice that they’re not reciprocating — do yourself a solid and give yourself permission to excuse yourself. Making new friends is fantastic, of course, but it’s not your responsibility to engage everyone you meet in a substantial discussion, especially if they just don’t seem interested. Thanks for sharing! I come across this blog few hours back. Find it interesting and informative. Keep posting.